Table salt contains sodium, an element that raises blood pressure and can damage the blood vessels. Left untreated, high blood pressure often leads to stroke, heart disease, kidney failure, and a host of other problems. People often become more sensitive to the effects of sodium as they get older. African Americans are often especially sensitive to sodium’s effects, as are people who are obese, have kidney disease and blood sugar problems. Our bodies only need about 180 milligrams of sodium daily. 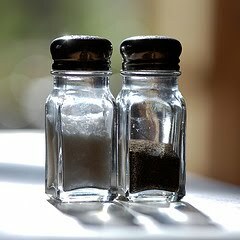 The U.S. Centers for Disease Control recommends that people with high blood pressure, people over the age of 40, and African Americans take in no more than 1,500 milligrams of sodium daily (2/3 of a teaspoon of table salt) - everyone else should stay under 2300 mg/day. Know that your taste buds will adapt to less-salty tastes. Avoid canned and processed foods. If necessary, you can rinse canned veggies to reduce sodium. Read nutrition labels - on everything! Uncooked chicken sometimes gets injected with salt for preservation and plumpness.... seriously. Use plain frozen fruits and veggies - but read the label just to make sure. Don't believe the package's claims of "low sodium" or "low salt" - low is relative. Limit eating at restaurants. Sad to say, but none of the dieticians Dr. Marcus spoke to could come up with any chain restaurants that serve low-sodium dishes. Feel free to cut down your salt intake slowly. Search for low-sodium recipes (try the recipe search HERE). Try to find a buddy, or a support group at a local church or health center. 2 Response to "10 Ways to Reduce Your Salt, Improve Blood Pressure"
Easiest way to control or maintain the level of blood pressure...very informative review..Thanks.. Informative Review..thanx for sharing with us.